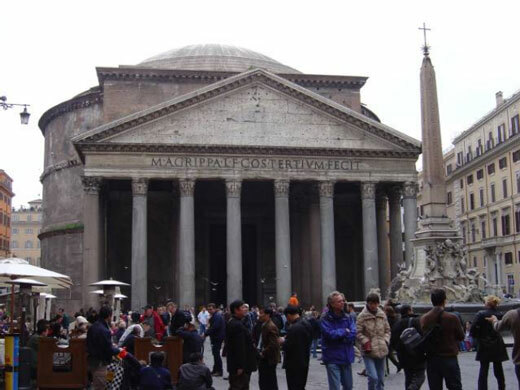 Located in Rome, Italy, the Pantheon was originally commissioned by the Roman statesman Marcus Agrippa and then later rebuilt by Emperor Hadrian around 126 A.D. The building was first used as a temple to the major gods of Ancient Rome. The design features a circular structure (rotunda) with a portico of granite columns supporting the pediment. 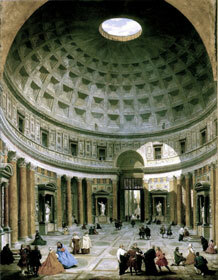 The rotunda sits under a coffered, concrete dome with an oculus (central opening) at its top. 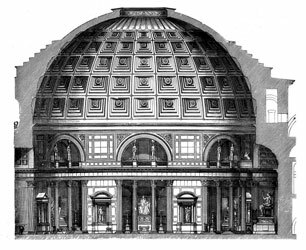 As the building was originally dedicated to the twelve most powerful gods of the Roman pantheon, the dome was intended to represent the sky dome and the heavens above. 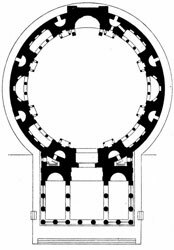 The centralized point of natural light provided by the oculus was symbolic of the sun being the source of all light on earth. 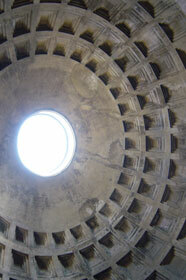 The Pantheon features the largest unreinforced concrete dome in the world. The thickness of the dome gradually reduces as the dome approaches the oculus. By doing so the overall mass of the dome, its internal stresses, and outward thrust could be minimized. The coffering further reduces the mass of the dome while articulating its overall appearance. The oculus with its natural light served as the primary source of illumination. On sunny days a circular beam of light tracks across the temple animating its interior. In addition to illumination, the oculus also serves as a method for cooling and ventilating the interior. Any hot air that builds up will be naturally drawn up and out the top of the building. Because the oculus is unglazed and open to the air, any rain water that falls into the building is carried away through an elaborate drainage system in the floor. The Pantheon creates a unique spatial experience resulting from a combination of engineering, symbolism, and emotional design. The spatial experience of a visitor actually begins well before they reach the building. As they walk through the nearby neighborhoods they are spatially compressed by the narrow streets and tall buildings. But once they emerge from the streets and enter the open piazza in front the building the space decompresses and opens up to the sky. At this point the visitor can then clearly the temple before them, but much of its form is obscured by its large entry portico. As a result they do not get any of the typical visual cues that suggest overall building form and interior volume. But as they move forward and enter the space under the portico they are immediately enveloped in shadow and drawn to the open, bronze doors. Finally, as they enter the rotunda they are met with the soaring overhead dome and bright central oculus. The open-air oculus is the only light source and allows the natural light to spill freely into the interior. And as the sun crosses the bright Italian sky, it casts a strong pattern of light across the colorful floors and walls creating an ever-changing luminous and spatial experience. The building itself is massive, but the interior experience is one of visual lightness and where the visitor cannot help but be emotionally connected to the divine.